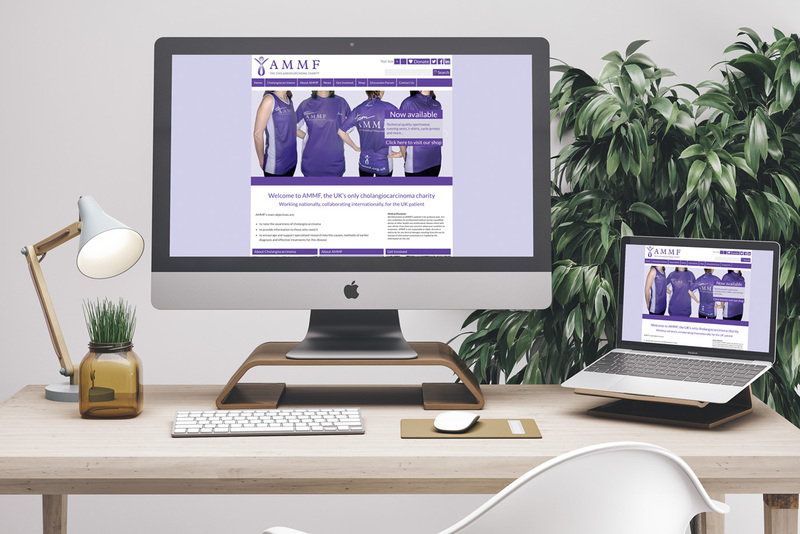 AMMF is the UK’s only cholangiocarcinoma charity, dedicated to tackling this devastating cancer on all fronts: providing information and support, campaigning to raise awareness, and encouraging and supporting research into its causes. It’s very much a hands-on charity, dedicated to bringing about improvement for the cholangiocarcinoma patient by working closely throughout the UK with patients, families, carers, clinicians, healthcare professionals, researchers, politicians and policy makers. 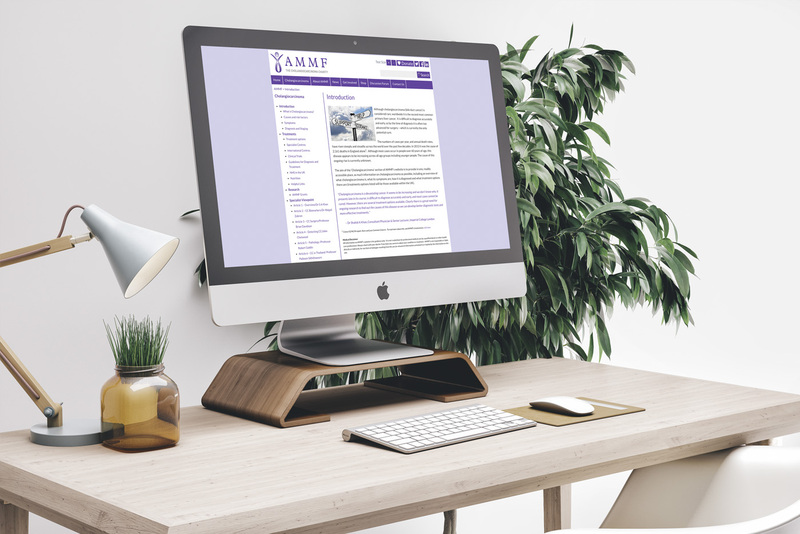 Like many charitable foundations, AMMF (The Alan Morement Memorial Fund) was established by those with a family connection and a personal commitment to the cause, but in need of professional resources to campaign for it. Simpsons was asked to bring its creative and technical skills to designing a website with the necessary authority and functionality to enable interactive communication with, and support from, fellow sufferers, their families and the public at large. We designed and built a website that has given a professional front to the foundation, and yet is nevertheless accessible and easy to navigate. This is of first importance in a public service site, which is one of – if not the –primary source of news and information about this disease in the UK. Two of the most notable features of the site are its interactive Discussion Forum, which allows sufferers and their families to record their treatment ‘journey’ and share insights and experiences: and an on-line shop, where a variety of the charity’s merchandise can be purchased on-line and donations made directly to the cause. Although simply presented the website is impressive in its functionality, and in addition to the above mentioned features has a content management system that allows for a constantly updated blog, news feed and search facility for accessing details of clinical trials and other relevant literature in the field. Simpsons Creative have been working with the charity for over two years, over which time we have been able to refine and add to the functionality of the website, which has proved an invaluable resource to those seeking information about cholangiocarcinoma, and has helped grow a supportive community of affected families, carers and consultants. Although technically demanding to design, build and manage, the Discussion Forum has been one of the most popular and widely appreciated features of the new, revamped website. It has both a national and international following, and users include all those whose lives have been touched in some way by cholangiocarcinoma (bile duct cancer, biliary tract cancer, gall bladder cancer) providing an area where patients, family members, carers, supporters, fundraisers and those who have been bereaved, can talk about all things related to the disease, tell their stories, ask questions, give and receive support, share hints and tips of all sorts – and there’s an area for off topic chat, too. “Given that our resources and budget are limited, Simpsons have been extremely generous with their time and support in designing, building and maintaining this website” says Helen Morement, director of AMMF. Their professionalism has made all the difference to the advances we’ve been able to make in raising awareness and supporting research into cholangiocarcinoma”.